This is not the first time since I last visited him in Kandahar, Afghanistan, four years ago that such unfortunate news reached me via emails. Usually the emails started with a long paragraph of greetings, wishing me and all my family members (whom he never met) good health, good fortune, and lots of happiness. Then the following paragraph would suddenly switch to a very formal tone as if copied word by word from an ANSO (Afghanistan NGO Safety Office) security alert report. At times, he would add a line or two after the “report” to fill me in on his own family losses from the aforementioned security incident. But on personal tragedy, he hardly elaborate, only presented as a matter of fact that so and so had died or injured or hospitalized. Like most Afghans I met during my travel there, everyone has at one point or another lost their loved ones during the long-drawn war, and when they recounted those losses, they were composed — no tear, no anger, no complaint, resigning to fate. An afghan goes to the market to buy a sheep head (a local delicacy) for dinner. He asked the vendor how much does a sheep head costs? The vendor replies, 50 Afghanis. The customer protests, shouldn’t it be 20 Afghanis? The vendor retorts, no way, this is not a human head! “Everything in Afghanistan is expensive except human lives,” K chuckled when saying this. A and K have both had close brush with death. A ducked through several cross fires at a Pakistan-Afghanistan border crossing; while K once caught a bullet in his chest when a shooting spree took place in broad day light in the streets of Kandahar, at that time, he only newly fathered a son. Though they always keep me posted but details are scant. 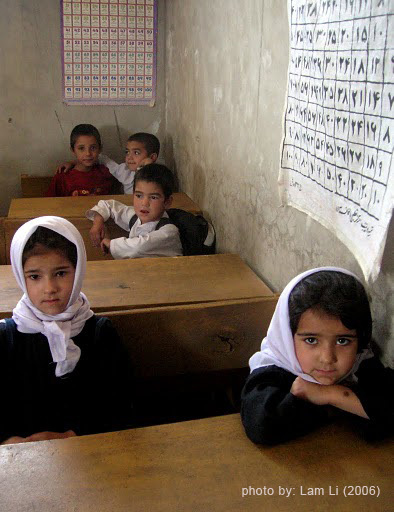 Do these Afghan kids have a future to look forward to? In fact, A’s own children came close as they returned from school just minutes after the explosion. Due to his job working with an international aid organization and kin ties with local chieftains, he and his family belong to the high risk group for terrorist attack. But they are just vulnerable civilians caught in the intensifying insurgency. One could not choose what family to be born into, with kinship tradition remain strong in the Afghan society, and the killing of local notables and their relatives by insurgents become routine occurrences, A and his family live with the reality of increasing threats. There is no accurate statistic of civilian deaths in Afghanistan caused by the prolong instability following the US-led “Operation Enduring Freedom” in 2001. According to the UNAMA (UN Assistance Mission in Afghanistan), in 2009, there were some 2,400 civilian casualties as a result of war. In the year when I was there in 2006, Human Rights Watch estimated 4,400 civilians were killed in conflict-related violence. On paper, the number of civilian deaths appeared to have dropped, but the frequency of me getting dismay messages from A in recent months revealed the contrary, Kandahar seemed a lot more like a war zone compared to the time when I was there. Perhaps, back in 2006, I acquired a false sense of security due to the protection A and his family extended to me, I didn’t learn of the high number of casualties until much later after I left the country. Though I remembered one day in June, I was left alone in an internet café in downtown and K was to come and pick me up at an appointed time. But I stepped out of the café earlier than expected and went to a nearby shop to chat with some locals, when I returned to the café as appointed, K had already been searching all over for me for some time, almost in tears, as he had received a security alert from ANSO that there was shooting in the area that morning. My ignorance of the real threat back then must have caused some anxieties for A and his family, though they always camouflaged the concern by downplaying the risks, like referring to the frequent echo of shooting or bombing from afar as the sound coming from a nearby military base where combat drill and training was held. Come to think of it now that sounded like the white lies the Jewish father told his young son that the Nazi concentration camp was all but a game in the movie Life is Beautiful. But the difference — I was an idiotic traveler looking for adventure and unknowingly putting others’ lives at stake. Such is the Afghan hospitality, once they recognize you as a friend, they would even risk their lives for you. If such care can be extended to a mere guest, one can imagine the sort of responsibilities they take upon themselves for kin. For A, it would be hard to just pack up his immediate family members (parents, brothers, sisters, and children) and leave Kandahar when the situation worsening, as it would pain him too much to leave behind other members of the clan. But a mass migration of the whole clan to neighboring Pakistan (where today it is no safe haven either) – like his father and uncles had done some 20 years back by buying up properties of an entire street to house the extended family members, and they repeated the feat by moving home after the Taliban fell – would be difficult to execute, especially when the family resources have been depleting as the war drags on. “We are extra careful nowadays, but we never know how long more we could remain safe. One day, at a pre-destined time, we may also have to leave this world, that’s the way things are.” A wrote in his latest email. Hi Li, m so please to reach and read your memories records. and i am definitely feel for the stories you’re sharing. and i have always fascinated by M.culture, their humble approach to life.. their unspeakable struggle.. their unvisitable spider web.. and the pure kindness, hospitality, protection++ that people can offer to stranger like us..
i wish i could express my thought, feeling, memories as free as you did. i have always interested and wanted to put my own adventure and abnormal encounter into writing knowing well that eventually one day it will slowly faded from my memories, especially the details.. But up to today i still couldn’t.. and reading your memories record, they are as if my own encounter. you are able to “type out” those that stuck deeply in my heart and brain but i couldn’t express much in writing..
how you felt about the anxieties we caused for them and their family, though they always camouflaged the concern by downplaying the risks / complication. when they say,“You are my guest, as long as you are in ____, your safety is my responsibility.” and that sort of responsibilities they take upon themselves for kin.. etc..
i am happy for and envy of u, not just for the fact that u picked up path unfamiliar for many to travel, more for your ability to make the memories and their story told and be listen to..
thanks for start writing  will surely drop by from time to time..
thanks for your encouragement, and sorry for taking so long to reply. I have been in a country where wordpress is blocked, only managed to acquire today a software that allows me to go beyond the great firewall. What inspire me to write is all those wonderful people I met on the road, I am sure one day you will also find the strength to write about all those kind souls you met along the way, powered by the desire to see them again.